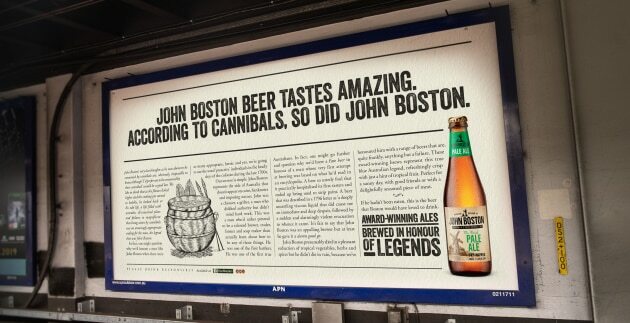 M&C Saatchi Sydney has released its first campaign for John Boston craft beer that taps into the unexpected legend behind the founder of the brand. Boston, a brewer whose initial beer didn’t pass the taste test of Old Sydney Town guards, was eaten by cannibals while migrating from America. The campaign aims to bring awareness to Boston's legacy and the beer he created. 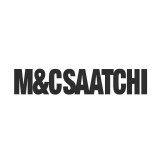 M&C Saatchi chief creative officer Cam Blackley says the campaign is about celebrating a legend and the quality beer. “John Boston’s story is about as outrageous as it is unknown. We know that he was among the first brewers in Australia and that his original beer was eye-wateringly bad," he says. “In fact, we know that the man failed at everything he did except dying in an incredibly interesting way. But he had this quality that is hard not to admire – he got back up and tried again every single time." Rachel Hofman, marketing manager at Pinnacle Drinks, says the ad aims to capture the Australian spirit of getting back up after trying and failing. “The result is a compelling brand platform which fully embraces John Boston’s cheeky, tell-it-how-it-is tone of voice to share the brand story, delivering visually impactful tailored messages on targeted platforms. The take-out overall is engaging and witty creating talkability," she says.